I'm going to pretend that I'm not doing these out of order, and while my Summer Love mani is finished, I wanted to bump this mani up to today because public school in my county starts today! I don't have kids, but the collective cheering of all the moms is deafening. 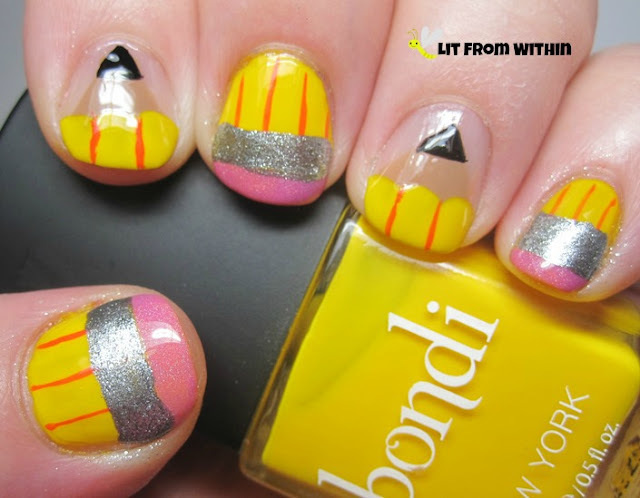 So, I've wanted to do a pencil mani, and I found this tutorial by Cutepolish that had the pencil tips, too! I couldn't resist. Her tutorial is really good, so I didn't do step-by-step pix. The only thing I changed was to switch the order of the erasers. She did pencil, metal, eraser. I did pencil, eraser, and then the metal part because I knew I'd need the denser silver to cover any mistakes I'd made! Here's the bottle shot of all the polishes I used for this mani: Bondi Brick Road, Zoya Flynn, stripers in orange and black, Above The Curve Michelle's Pink Polish, and Revlon Sequin. If I don't have kids, how did I know that school starts today? Well, my friend Toni wanted a new mani to start school. She chose these adorable pandas! I couldn't find the Instagram account she used for the tutorial, but this mani looks like the template I used. 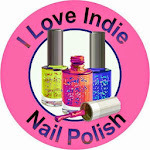 I used Essie Shop Till I Drop for the pink base, and Cult Nails Tempest and Nevermore for the art. Even though this is a simple mani, I'm proud of it. Toni's mom, Jill, is quitting smoking, and her nails and cuticles have taken a beating. Jill didn't think she had enough nails to paint, but I wanted to do something for her, and she loves black nails. 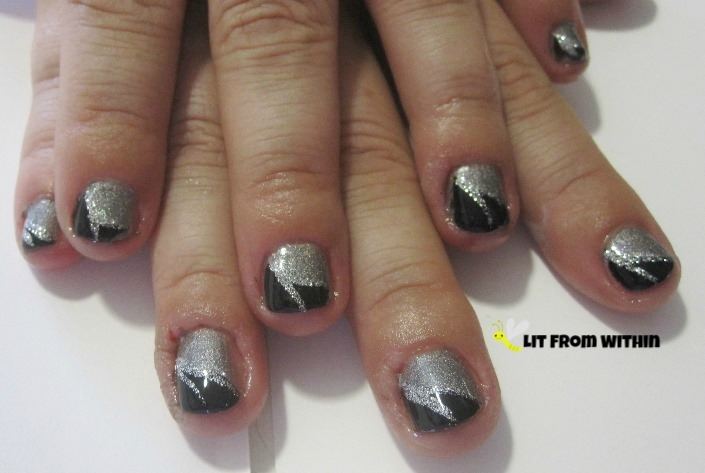 I used Liquid Sky Lacquer Rain Cloud with a tip of Cult Nails Nevermore and a bit of silver nail art glitter striper. Thanks! It was a great tutorial video. I'll have to watch more of her stuff! Those pencils are TOO DARN CUTE! I love those! 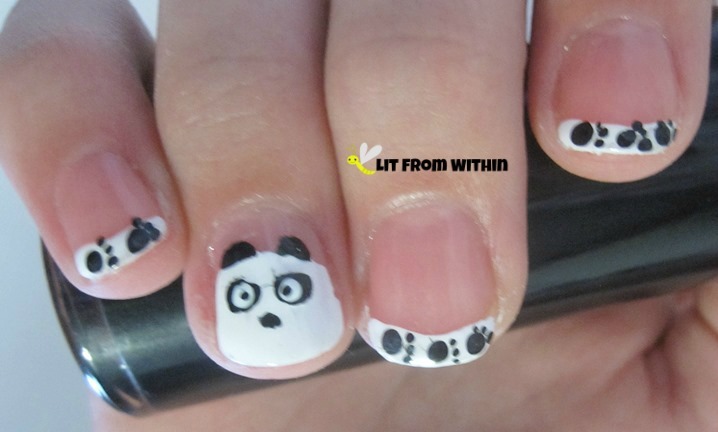 The pandas are incredible, too! You rock! Maybe I could use more exclamation marks!!!! Here's a few more!!! Lol. Thanks, T! Fabulous recreation! I'm deciding whether I should do this or notebook paper for my back to school manicure. Thanks! I was thinking about the notebook paper, too! So cute. I like your pencils, it's a cool idea! I can't decide for diaries or notebook, damn! The pandas are cute too! 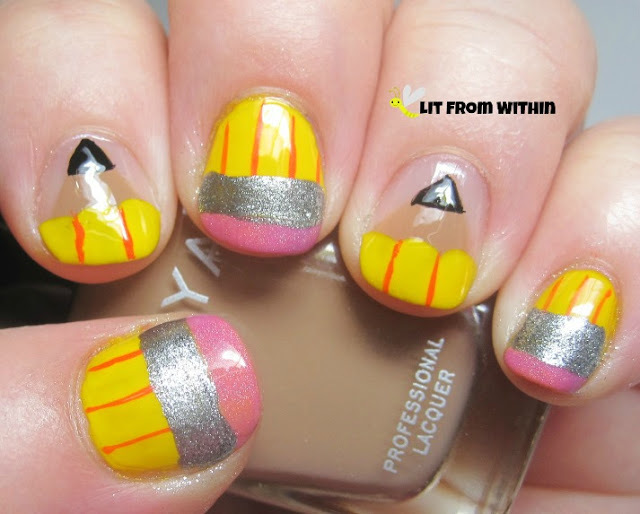 I haven't seen diary nails! I hope you'll post them (or a link) if you do them. I want to do notebook paper ones at some point. Thanks!